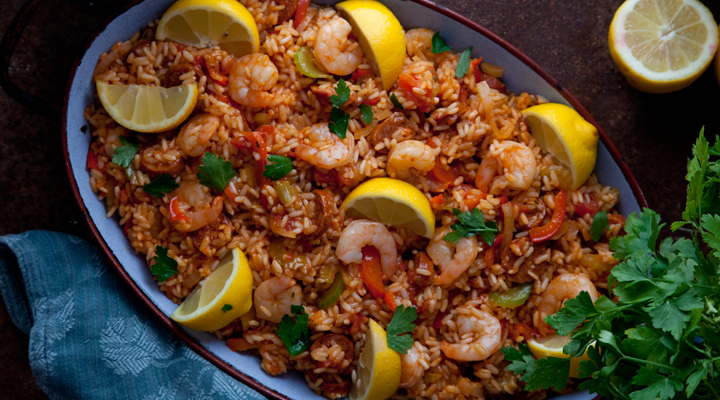 Jambalaya is a traditional rice dish from Louisiana that’s packed full of vegetables, meat and fish. Besides being super tasty and filling, this is quick and easy to prepare. If buying frozen prawns, a 250g bag should give the required amount once thawed and drained. Heat a wide sauté pan (that has a tight-fitting lid) over a medium heat. Add the chorizo and cook for 2 to 3 minutes, until it’s beginning to catch colour. Remove to a plate lined with kitchen paper, leaving the oil behind. Add the onion, celery and peppers to the oil and gently fry for 5 to 6 minutes, until soft. Add the garlic, Cajun seasoning and thyme and cook for 1 minute more. Pour in the rice, stock and tomatoes and bring to the boil. Pop the lid on and reduce the heat to simmer very gently for 20 to 25 minutes, until the liquid is absorbed and the rice is tender. Stir the chorizo and prawns through and cook for a further 1 to 2 minutes, until the prawns turn pink. Season to taste and serve with a scattering of parsley and with lemon wedges on the side for squeezing over. Delicious & a great winter dish! Very easy to prepare also. I subbed the chicken stock with beef for a slightly richer taste. Absolutely fantastic. My husband had three helpings. The only thing I might add is that the prep time took me a bit longer than the 10 minutes stated (though I am not a very experienced cook, so maybe that will come with time).